In a previous post, I mentioned Epic vital signs alerts with values that were way out of range. Several readers commented, with one saying this couldn’t possibly be a client value and another wondering what other customer-built “garbage” might be in their system. The original reader who shared the alert sent me a screenshot of the Epic foundation build, showing the Epic-released values that are delivered read-only. Although you can modify it on age-based overrides, the the maximum pulse of 500 is out of the box. Even worse, I noted that the pulse values all have trailing zeroes. I’ve spent more than a decade arguing with EHR vendor staffers about the concepts of precision and significant digits, and the fact that trailing zeroes don’t belong in fields like these. Since a pulse measurement obtained via traditional clinical skills can’t technically be precise to two decimal places, it shouldn’t be reported as such. Weird News Andy chimed in as well, suggesting that perhaps it was an alert for hummingbirds. It’s National Public Health Week. Events in our area focused on tobacco, obesity, and diabetes. One of our offices had planned to host a blood drive, but it was canceled by the blood bank due to an “equipment malfunction.” I’m not sure what might be malfunctioning that would prevent us from using disposable collection gear, but we weren’t able to find another agency that had availability. Hopefully we’ll be able to make up for it next month. Several of my consultant friends have a betting pool running on when CMS will release the MIPS/MACRA proposed rule. It looks like it has gone to the White House Office of Management and Budget, which might mean we could see it sooner than some of us thought. I’m banking on Memorial Day weekend since CMS has made a habit out of releasing it just before long weekends. By law, it has to be released within 90 days, but I think there may have been one recent proposed rule that came out past the 90-day mark. I’m too tired to Google it though, and it doesn’t really matter, so props to those of you who know for sure. I’m seeing a deluge of information from professional societies asking their members if they’re ready for MACRA, which is funny because many of the front line physicians I talk to don’t even have an idea what it is. I mentioned it before, but the White House petition supporting a voluntary patient identifier doesn’t seem to be getting much traction. Only 6,000 people have signed it since it went live on March 20. It needs nearly 94,000 more signature prior to April 19 in order to receive a response from the White House. Although the Executive Branch can’t actually solve the problem, getting enough signatures on the petition would make a statement. If you’re supportive, please consider signing to have your voice heard. The AMIA iHealth conference is right around the corner. I’ll unfortunately be attending another conference at the same time, but am interested to hear from readers that may attend. It’s approved for 12 hours of ABPM LLSA credit, so if you’re board certified in Clinical Informatics and haven’t started earning your hours, it would make a nice start. I’m nearly done with my continuing education for the year, which is a good feeling. The only thing I have left is a module for my primary board certification, and I’m waiting until summer when a new MOC paradigm goes into effect for us. I often have physicians throwing articles at me with ratings and rankings of the “best EHRs.” Such pieces generally drive me crazy, because once you dig into the number of participants and truly dissect the data, it is often poor. In one recent study, the physicians polled couldn’t even correctly identify their vendor and instead claimed they were using systems from vendors such as “CPOE” and multiple acronyms developed by hospitals to brand or market their systems. The prize for the best article of the week goes to GomerBlog, however. Thanks for the laugh because I sorely needed it this week. 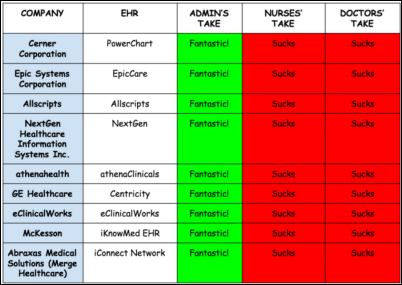 What’s your favorite EHR? Email me. No, Andy, your joke goes in the wrong direction. Need the decimals for slow, not fast hearts. Seals, maybe? Hibernating bears? Not exactly correct about the decimals/trailing zeros. The screenshot you have would lead you to believe that it would allow you to document two decimals, but if you could click on the “Numeric” tab of that screenshot, you’d find that as released, it allows zero decimal places. So the vendor has to design their software with your current limitations in mind rather than planning on ahead? Are there no machines that can measure the pulse which on average comes out with decimal values? Should the organization be forced to take an upgrade, perform yet another conversion to make use of new machines? For all I know Epic already interfaces with such machines. Should they architect their software to have separate fields for machine-measured vs human-measured values? Or should they throw those values out and round up/down? If 5 years down the line, you do want those fractions and now you’ve lost them, what do you do? Maybe they can track down some anomaly with the fractions which they wouldn’t be able to have done otherwise. When you architect something you have to keep the future in mind. You can’t design with a narrow mindset. @RobertLafsky – Andy’s joke was about the original vitals alert of 500…. @AC – I follow what you’re saying, but traditional scientific notation has rules which the vendors should respect. Additionally, pulse has a clinical definition – the number of heart beats per minute – which is derived by counting the beats in a 60 second period, not by averaging. I’d suggest that if future technology develops a new way of measuring pulse, that a new field be created and labeled as such. There are too many programmers that think you can just relabel a field when sentiments change or that you can use a field that used to mean one thing to now mean another. I’ve dealt with this type of issue with three major vendors now, and always with significant clinical consequences.